Political language is a tongue, one that is optimally designed to infiltrate both thinking and feeling at the same time. Sarah Hurwitz, speechwriter for Michelle Obama, is a master at getting words to work at all those levels at the same time. Oratory brilliance takes me straight to awe. Writing about art is strangely similar. When done well it speaks to our cerebral consciousness as well as our emotions, those often inchoate feelings that reside somewhere in our bodies other than our brains. The best writers about art, like the best orators, know how to hit all those spots. I wish I had those skills. I am a visualizer with a huge crush on verbal language done well, so I catalog more words than I create. This blog is a compendium of my favorite passages, the ones that have achieved that thinking/feeling connection. We have been given a very special place to understand things larger than ourselves, all the time, intuitively sometimes, and sometimes through exertion. Buddha, for example, went through all kinds of processes—hunger, torture, everything—to get knowledge, and finally decided that those were not the paths by which he could be enlightened. So he adopted the path of life, and concluded that wisdom and Enlightenment are not based on staying away from reality but on staying very close to reality and, at the same time, trying to understand it. The depths of knowledge and the depths of perseverance, and character-building—these are essential aspects of any creative process, where you submerge yourself to understand something, and not worry about the historical footnotes. 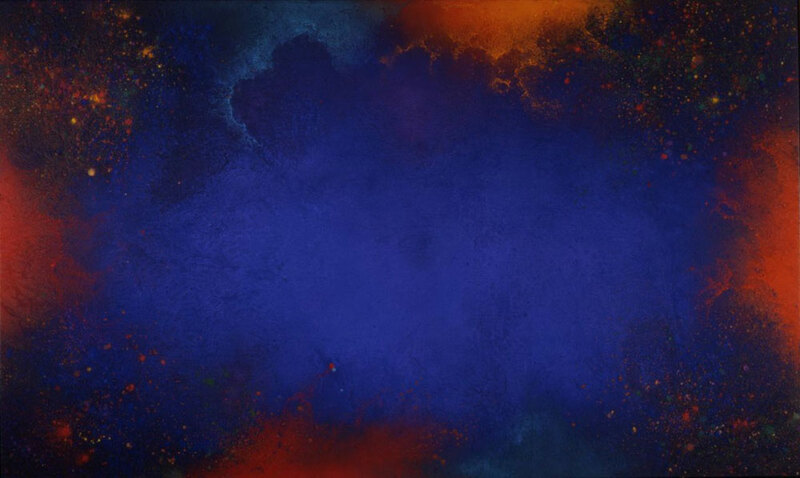 Bhavsar is attracted to pure pigment because of its physicality, and the way in which it makes color, or rather color/pigment, physical. But Bhavsar believes that the materiality can also be transmaterial or spiritual. In the West, matter and spirit are generally viewed as incompatible. But not in India. Bhavsar has dealt with an issue summed up by Geeta Kapur. “The classical civilizations of the Asian region hold out a continuing lure for the transcendental. In the matrix of Asian cultures, the metaphysical is a vexed category on account of the more recent secular convictions; this is precisely a matter for an aesthetic avant-garde to tackle.” In a world wracked by national conflicts, racism, genocide, famine, pollution, ecological devastation and crime, Bhavsar’s painting is an oasis of contemplation in which alienation, desperation, despondency, rage, and other psychic wounds can be calmed, a state of repose necessary to human being. Diane, that is a wonderful quote, and reminds me of why I love “The Goldfinch.” And Bhavsar’s paintings and this blog. Thank you for posting that gorgeous passage from Tartt’s wonderful book Diane. And yes and thank you to Daramark. So appreciate your words, both of you. Hi Deborah, Thank you for another thoughtful and interesting post. In the last lines of the quote: ‘a state of repose’ reminded me of what Max Richter said about his ‘eight-hour lullaby’ – the album “Sleep” – ‘a point of repose, a place to rest’ he called it. Thank you for Slow Muse. Alison, Thank you so much for your contribution to this discussion. Solitude and Surprise. Gotta Have Both.